Arrow Cleaning Services provide residential and commercial window cleaning throughout East Sussex including Eastbourne, Pevensey, Hailsham, Stone Cross, Polegate, Hampden Park, Bexhill, Ninfield, Cooden, Little Common and surrounding areas. As well as using a Water Fed Pole system to ensure quality results they also provide additional cleaning services including fascia and soffit cleaning, gutter cleaning and driveway cleaning. For a free quotation or find out more details of their services then call the number below or visit their website. MJP Cleaning provides commercial and residential window cleaning services throughout the Essex region of Canvey Island and surrounding areas including Benfleet, Hadleigh, Rayleigh, Hockley, Basildon, Hullbridge, Wickford, Leigh on Sea, Westcliff on Sea and Southend on Sea. Using professional Water Fed Pole systems to ensure quality results they guarantee customers the best possible service. All staff are uniformed and the company is fully insured for up to five million pounds. Additional exterior cleaning services they provide include conservatory and conservatory roof cleaning, fascia and soffit cleaning, plus gutter cleaning using the professional SkyVac cleaning system. We Can Clean It based in Hampshire have many years experience in the window cleaning industry and provide professional cleaning services to both residential and commercial customers. Services offered include Window and conservatory cleaning solar panel cleaning, fascia, soffit and gutter cleaning, conservatory roof cleaning, plus driveways, patio and pathway cleaning. Full range of services are detailed on their websites. Based in Ashford in Kent, Reach ‘N’ Shine is a company with over 15 years of experience in the cleaning industry. 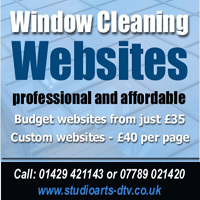 Services offered include domestic and commercial window cleaning, upvc cleaning and carpet cleaning. The cleaning materials used are ‘Eco friendly’ and triple filtrated de-ionised water is used to clean windows with their high reach water fed poles. This system can be used to clean windows up to 3 storeys high and safely from ground level. To contact Reach ‘N’ Shine please visit their website or use the telephone numbers below. Essex Window Cleaning based in Westcliff on Sea offer a professional commercial and residential window cleaning service throughout the Essex area. The company use pure water fed pole cleaning methods as well as traditional methods where necessary. Commercial customers include schools, shops, public houses and office buildings etc. Essex Window Cleaning also provide a range of other cleaning services as well which includes conservatory roof cleaning, jet washing, solar panel cleaning, communal cleaning and fascia and soffit cleaning. JR Cleaning is based in Rochester, Kent and provide a professional and affordable window cleaning and carpet cleaning service to professional standards. They also do upholstery cleaning as well as cleaning conservatories, gutters, fascias and soffits. The company caters for both residential and commercial customers in the Kent area and their cleaning methods incorporate the very latest technologies. For window cleaning they use a water fed pole system which is environmentally friendly and for gutter cleaning they use the high reach Skyvac system for fast safer cleaning. For carpet cleaning they use the Twin Vac Prochem carpet cleaner which produces a high quality clean. J R Cleaning are fully insured and adhere strictly to health and safety guidelines to ensure the work is carried out to a high standard and a high degree of safety. All Seasons Window Cleaning based in Farnham, Surrey provides a friendly, trustworthy and highly professional window cleaning service to both domestic and commercial customers in the Farnham area on a regular basis. Their cleaning methods incorporate using purified water fed through a high reach pole systems for long lasting outstanding results. All Seasons Cleaning Services has gained a solid reputation for being a company that you can rely upon. Not only do they provide a high quality window cleaning service, they also provide other related cleaning services as well. These include carpet cleaning, gutter clearing, pressure washing, patio and driveway cleaning, conservatory roof cleaning, plus fascia and soffit cleaning. TWC Services Incorporated can provide solutions to all commercial, retail and domestic window cleaning needs. give them a call now and they will be pleased to give you more information and answer any questions you may have. Their services also provide fascia, soffit and gutter cleaning, as well as conservatory and conservatory roof cleaning. Free quotation on request and they can arrange an appointment to discuss your requirements in more detail if necessary. Formed in 1995, D.A.C. Contractors Ltd are a leading commercial and residential window cleaning company with almost 20 years of experience and expertise. Based in Maidstone in Kent the company prides itself on being able to offer the same level of quality and personal service to all of their customers, whether residential or a small to medium or large company. D.A.C. are able to combine traditional methods alongside innovative state of the art ‘reach and wash’ system technology. Their ultimate goal is to provide all customers with a safe, reliable and environmentally friendly quality service. Stevenage Window Cleaners provides a professional, reliable, domestic and commercial window cleaning service in Stevenage and Hertford areas, as well as Harlow, Ware, Stansted and surrounding areas. Using the latest water fed pole window cleaning equipment the company provides a modern professional service but also use traditional window cleaning methods where required. The company is fully insured work is carried out to a high standard and a degree of safety that complies with Health & safety regulations. So if you need a window cleaner in Stevenage or any of the surrounding areas then call them on the numbers below. EEP Window Cleaning Services based in Cheshunt and cover Goffs Oak, Cuffly, Turnford, Wormley, Hoddesdon, Roydon and North Chingford as well as Cheshunt. EEP provide a highly professional and reliable window cleaning service using traditional and water fed pole cleaning methods that offer exceptional results. As well as window cleaning they also provide relates services including gutter cleaning, fascia and soffit cleaning and conservatory cleaning. Streak Free Windows are based in Ongar, Essex. and cover the areas of South Essex and East London. Streak Free provide a local window cleaning service using the latest ladder free pure water technology, no ladders and no chemicals so it is safe for your property and safe for the environment. They guarantee streak free clean windows, include your frames, sills and doors every time and can even clean your conservatory roof. They offer a reliable service and there is no contract to sign. The provide their services for as long as you require them. You will have your own dedicated uniformed window cleaner whom you will get to know, not a gang and they will provide a courtesy call or text to let you know they are coming so no nasty shocks. Ishine window cleaning services are an established company with many years experience in providing commercial and domestic window cleaning services in the areas of Southampton and Bournemouth. Their highly trained staff can provide a comprehensive service for anyone requiring a regular or one-off window cleaning service in the areas listed below and are willing to travel all over Hampshire and Dorset for larger jobs. From their Hedge End branch they cover all areas of Southampton including, Eastleigh, Hedge End, Bitterne, Chandlers Ford, Fair Oak, Botley, Chilworth, Park Gate and surrounding areas. From their Southbourne (Bournemouth) branch they cover all areas of Bournemouth including Southbourne, Springbourne, Boscombe, Pokesdown, Christchurch, Winton, Westbourne, Kinson and surrounding areas. Gleams Window Cleaning based in Rainham in Medway provides a friendly and professional window cleaning service for residential and commercial customers in the Medway area. The company use a high reach, hi-tech purified water system that is better for your windows and better for the environment. Other exterior cleaning services they provide include conservatory cleaning, gutter cleaning and fascia and soffit cleaning. Taylor Cleaning Company based in Sompting, West Sussex provides a friendly and professional, high quality commercial window cleaning service covering the South East of England. Their cleaning methods incorporate using a water fed pole system which provides a more effective cleaning experience and more privacy for the customer. Adhering strictly to health and safety guidelines, you can expect theTaylor Cleaning Company to always ensure that work is carried out to a high standard and a high degree of safety. Areas covered include Brighton, Hove, Lewes, Eastbourne, Newhaven, Seaford, Worthing, Littlehampton, Bognor Regis, Chichester, Pulborough, Crawley, Horsham, East Grinstead, Haywards Heath, Sutton, Cheam, Croydon and surrounding areas. D M Services based in Hadleigh, Essex provide a professional domestic and commercial window cleaning service in Benfleet, Hadleigh, Rayleigh, Ashingdon and the surrounding areas. Founded by the owner Darren Charman in 1996, the company has gained a solid reputation and are members of The Master Guild of Window Cleaners. The company is fully insured and provide traditional cleaning methods as well as a water fed pole system for high reach cleaning using purified water. Hotel Window Cleaning based in Maidenhead has over 20 years experience in the commercial sector. Their clients range from a number of small family owned hotels all the way up to national high end prestige hotels. The company can provide high-level access equipment where required, including cradles, platforms and for inaccessible tasks, abseiling. Hotel Window Cleaning also provides a high quality professional carpet cleaning service.